On June 12 get out your car or motorcycle that catches everyone’s eye, and go for a cruise over to the Angels With A Dream event. 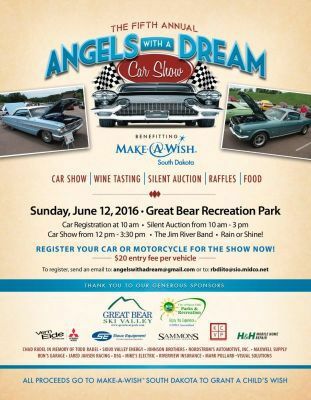 This free event benefits Make-A-Wish South Dakota, and will be held at Great Bear Recreation Park near Sioux Falls, S.D. Last year they were able to grant two wishes. This is the fifth annual event, and they hope to grant even more wishes. The event will start with car registration at 10 a.m. Pre-registration is required because there are limited spots available. There is a $20 registration fee per vehicle. If you would like to register today fill out the form and email it to Angels With A Dream. Car show judging will start at 11 a.m. and go till 3:30 p.m., with awards at 4 p.m. There will be a silent auction from 10 a.m. to 3 p.m. There are a lot of great auction items, including a 2016 Augustana Division II championship basketball signed by the team and the coaches, autographed Jared Allen Vikings jersey and autographed Randy Moss Vikings jersey, and an autographed Marilyn Manson guitar. There will be awesome raffle items as well! A fabulous wine tasting will go on during the event if you would like to taste an assortment of wines. Last but not least the Jim River Band will be playing during the event. This event got started because of a cancer patient named Bill Johnson, who battled cancer for ten years before he passed away. Bill’s dream was to grant wishes for kids, but was never able to do so before he passed. After his passing his wife Roxie had an idea to start Angels With A Dream in his memory and fulfill his wish of granting children’s wishes. Since she started four years ago, they were able to grant six children wishes. Through the wish process she has gotten to know the wish kids and their families making this experience even more rewarding. Well that’s not an issue at all! If you still want to help grant a child with a wish you can donate an unused vehicle to Wheels For Wishes. We take vehicles you no long want or need. They can be new vehicles or ones that have seen better days. It doesn’t matter! When you donate your vehicle you get a great tax deduction and the proceeds from your vehicle goes to local wish kids. Wheels For Wishes was able to make this process easy; you can fill out the car donation form or call 1-877-431-9474. It’s as simple as that! Make a wish come true today.